A battered war hero, an abused woman, and a body of neglected work come together in an emotionally complex story set in Cambridge, England, in 1816. It is the story of the seductive power of words and the triumph of love over fear. Some scars cut deeper than others. Major Andrew Holden returns to Cambridge a battle scarred hero. He dared to love Georgiana once and suffered swift retribution from her powerful family. The encounter cost him eleven years of his life. Determined to avoid her, he seeks work to heal his soul and make his scholar father proud. The work she offers risks his career, his peace of mind, and (worst o f all) his heart. Can he protect himself from a woman who almost destroyed him? Does he want to? Even poetry, with its musical lyrics and sensual traps, is dangerous when you partner with the love of your life. 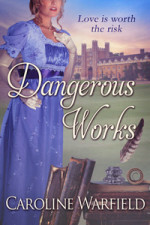 In Regency Cambridge it can lead a lady quickly past improper to positively scandalous.